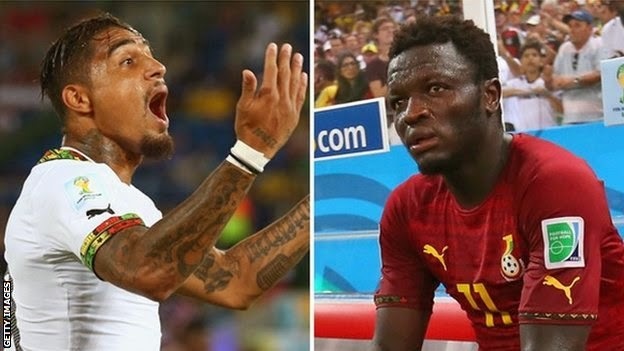 Sulley Muntari and Kevin-Prince Boateng have been expelled from Ghana's World Cup squad for alleged indiscipline. A statement on the Ghana Football Association said both players had "been suspended indefinitely". It added Boateng had used "vulgar verbal insults targeted at Coach Kwesi Appiah" and said Muntari was guilty of an "unprovoked physical attack on an executive committee member". The news comes just hours before Ghana take on Portugal on Thursday. The Black Stars still have an outside chance of qualifying for the knockout phase of the tournament. The Ghana FA statement said the incident involving AC Milan's Muntari took place on Tuesday and named Moses Armah, a member of the team management, as the man said to have been assaulted by the 29-year-old. And Schalke 04 player Boateng, 27, was said by the Ghana FA to have shown "no remorse for his actions", which took place during the team's training session in Maceio on Tuesday. Ghana's World Cup campaign has already been blighted by a dispute over players' appearance fees. On Wednesday, the national government sent in excess of $m in a chartered plane to Brazil to pay the squad following their threat to boycott their final group match against Portugal if they did not receive their money. To reach the last 16 Ghana need to beat Portugal and hope there is a winner of the match between Germany and United States - although the Black Stars would also need to overtake their rivals' superior goal difference.